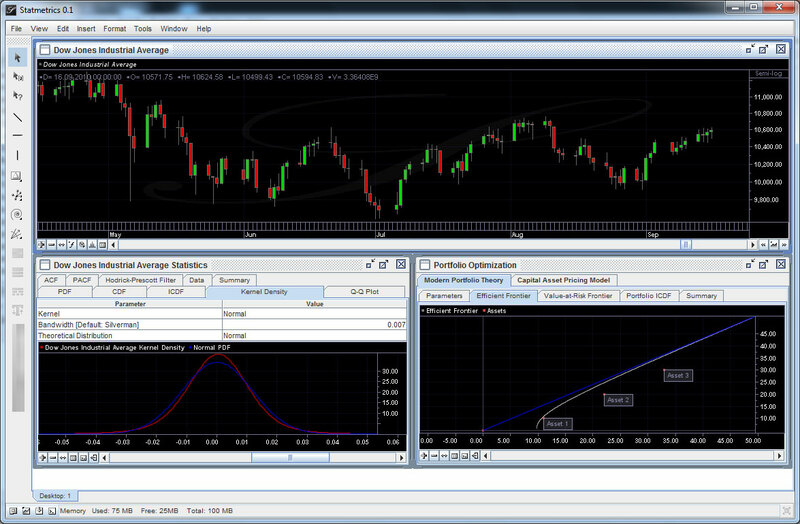 Statmetrics is a free cross-platform software application providing an interactive environment for computational finance. Statmetrics combines innovative quantitative finance technologies with traditional technical and econometric analysis methods. Statmetrics can be used in diverse fields to perform econometric analysis, technical analysis, risk management, portfolio management and asset allocation. StockMarketEye is an easy to use portfolio tracker and stock watcher that helps you keep an eye on your investments and the markets. Track the performance of your investments with portfolios. Keep your eye on the market with watchlists. Gain perspective on market movement with dynamic stock charts including technical indicators. Get free quotes, updated automatically or on-demand from most major world exchanges.